One of the joys of fall cooking is the abundance of apples. Local apples abound in Missoula for the next month or two: Macintosh, Transparents, Ruby Reds, Sweet Sixteens, Pink Ladys, and Honey Crisp to name a few. Apples, of course, are well suited for sauce, cider, and pie. 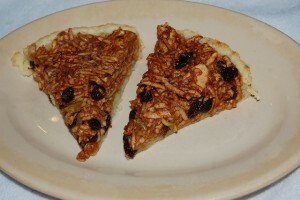 One of my favorite apple dishes is the tart recipe below. Simple and tasty, the tart makes a wonderful finish to any autumn dinner or the perfect breakfast treat. Mix the flour, salt, and sugar in a medium bowl. Cut in the butter with a pastry cutter. Once the flour and butter resembles fine crumbs, add the beaten egg. Mix only until the dough begins to stick together. If the dough is too dry, add drops of water until it holds together. Place in a sheet of wax paper, press together lightly, and chill in the refrigerator for 15 minutes. 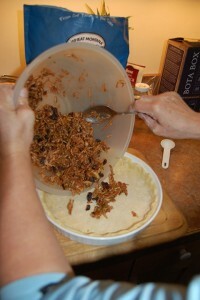 Once the dough has chilled, remove from the wax paper and use your hands to press into a 9-inch tart or pie pan. While the tart crust dough is chilling, make the apple filling. Quarter and core the apples. You may leave the peel on the apples. Coarsely grate the apples then mix with the cinnamon, sugar, and dried fruit. Place in the tart shell and smooth out. Spoon the corn syrup over the filling, and then dot the filling with the diced butter. Bake for 35 – 40 minutes. Cool for 10 minutes and eat warm with whipped cream or vanilla ice cream. Serves 6 – 8.